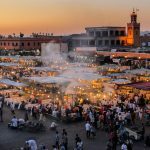 Introduction: 5 Days Marrakesh Marrakech. 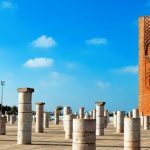 This tour of 5 Days/ 4 Nights from Marrakesh to Marrakech will be ideal for you, where you will enjoy a full experience. 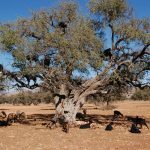 We will take you on a wonderful journey through the high & Small Atlas Mountains, Berber Villages, Kasbahs, Gorges, Canyons, Sahara Desert (Erg Chebbi dunes) and Desert Villages. 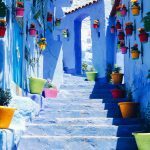 Today, we pick you up from Marrakech, and departure to Ait Benhaddou over the mountains of high Atlas passing through the Tizi N’tichka pass (2260 m in altitude), visit the Kasbah of Ait Ben Haddou and stop for lunch in a local restaurant. 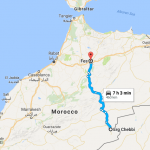 In the Afternoon we will drive to Ouarzazate and stop near the atlas film studios for a photo then continue to the city center for a panoramic view of the Kasbah of Taourirt. After that you will head to Kalaa M’gouna for a night. 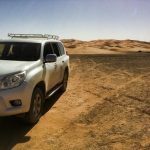 Day 2: Kelaa M’gouna-Boumalne Dades – Todra Gorges-Tinejdad-Erfoud-Erg Chebbi (Merzouga). This morning after breakfast in the hotel, driving towards Tineghir passing by Boumalne du Dades and stopping for a panoramic view of Dades valley. Later on, we will continue to Todra gorges via Imider and Tineghir. Stopping along the way for photos and admiring the views. Arrival to Todra Gorges to enjoy its marvelous Canyons views while hiking on foot. In the afternoon we continue to Tinejdad and have a break for lunch then to Erfoud where you will visit a local fossil craft workshop. 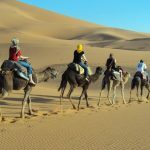 Wake up early morning to enjoy the sunrise on the top of the dune in the Sahara Desert then have your breakfast. After these beautiful moments, you will ride your camel back to the hotel where you can shower. 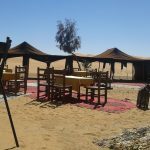 You will have a tour of the dunes on 4×4 allowing you to visit the black volcanic rocks of fossils, visit a nomad family living in tent, visit to Khamlia village and entertainment of their spiritual music of Gnawa, and visit the lake Dayte Sarji that forms in springtime which attract pink flamingos and wildlife. 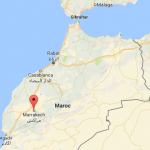 Then you will have a break for lunch in Merzouga or Hassi Labied. After lunch you will see the canal irrigation system and have a walk on the oasis located on the foot of the dunes. Continue to your hotel for shower and relax. This morning, after breakfast in the hotel, we will drive back to Ouarzazate via Rissani, Alnif, N’kob, Agdz . you will have time to invetigate the souk of Rissani, then drive to Alnif, home of trilobite. Later we continue to N’kob for lunch. After lunch we head toward Agdez and stop for a panoramic view of the palm groves of Daraa Valley. Later we will cross Ait saoun Mountains to reach Ouarzazate. Day 5 : Ouarzazate-Ait benhaddou -Tizi N’tichka Pass- High Atlas Mounatins-Marrakech. Today after breakfast in the hotel. You will have time to visit the kasbah of Taourirt then another photo stop near the atlas film studios. After that you will visit the Kasbah of Ait Benhaddou and stop for lunch in a local restaurant in the village. In the Afternoon we will drive to Marrakech, the red city over the mountains of high Atlas passing through the Tizi N’tichka pass (2260 m in altitude). 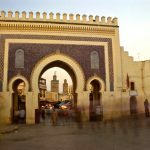 Arrival to Marrakech and Drop off in your address.